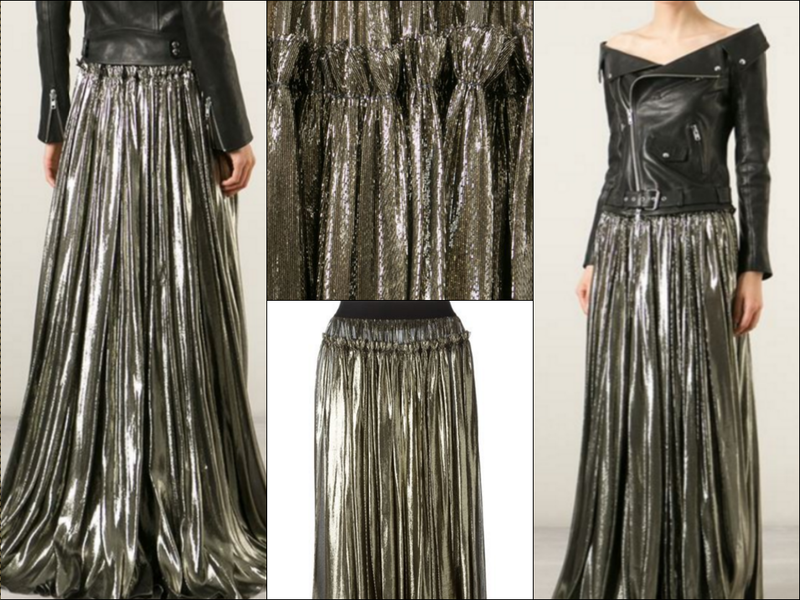 The metallic pleated skirt is a perfect example of slow-burn item trends meeting faster-moving colour/material trends head-on as retailers and brands add newness without scaring the customer off with anything too radical. The pleated skirt is a keeper – popular for a while, it’s also set to be a biggie for SS16 (that Gucci leather and snakeskin option makes me go weak at the knees). So where’s the newness this party season? Metallics. The versions seen here work as a perfect option for party 2015 and also give us a preview of SS16’s big metallics trend. Interestingly, while silver’s the key metallic for next season (and the one that just feels ‘right’), retailers are mainly going for gold this party season. 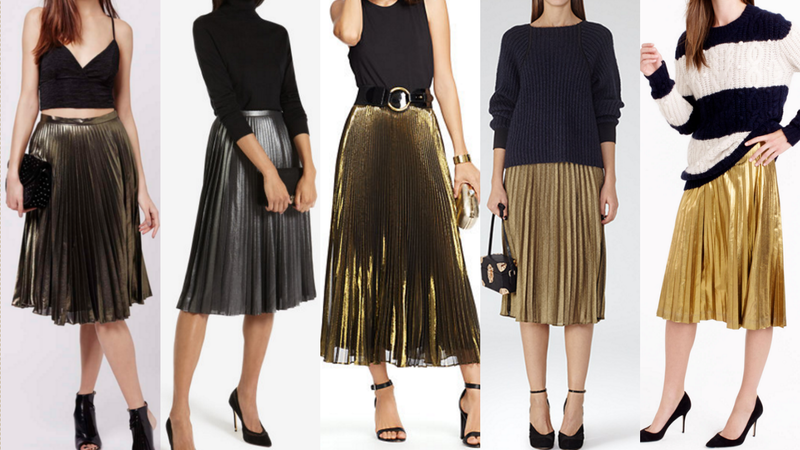 We’re not seeing many metallic pleat skirts at the very lowest price scale. But we are seeing a lot of them at the £500 to £1,000 level. Most of those are beautiful (like the floor-length option by Faith Connexion) blending silk, metallic and polyester in a way that feels softer and more fluid than the cheaper versions. But £500-plus for a skirt that doesn’t quite look different enough from one that’s way cheaper? I’m not sure if Millionaire Me would go for that, let alone Miserly Me. Well, price is still key. Lauren Ralph Lauren’s £285 option (plenty of silk in there) bridges the “HOW much? !” and “WOW, that’s cheap” gap pretty well, although it would still be out of most shoppers’ price ranges. The Ted Baker £119 skirt leaves me thinking “what justifies the price?”, although the pewter colouring is a point of difference. It beats the J Crew skirt at £128 – the gold is just too brash and a bit too ‘fancy dress’, plus in most of the photos on the website it looks like it creases like crazy. Reiss’s £130 offer (again, 100% polyester) is a bit too, err, boring to make the medal podium. But Topshop is up there with the winners – if only because its skirt is £60 and it comes in petite sizing for all us height challenged gals. But I also like that fact that it manages to actually shine without being OTT. It does all feel a little underwhelming with retailers relying on the metallic combined with the popular pleat detail to sell the item. I wonder how many people I’ll bump into wearing them this party season? Check back next week to see for my next Comp Shop and see my Gucci pre-fall 16 analysis for more on metallic pleated skirts. I had one in the 80s and wore it all the time — great with a tuxedo and Doc’s …… I just wish a retailer would either do one in larger sizes or do a comf waistband ….. some of us need a bit of stretch these days ! That’s the good thing about the J Crew skirt, it comes in a massive range of sizes rather than just ultra skinny, skinny and slightly-less-skinny.